What is a Smart TV and How Does It Work? The most important things to consider when shopping for a TV are screen size, picture quality, sound quality, and connectivity. The advent of smart TVs, however, has brought another dimension of capability to your video experience. Smart televisions are made by a variety of manufacturers including, but not limited to, those made by LG, Samsung, Panasonic, Sony, and Vizio. What Is a Smart TV, Anyway? In a nutshell, a smart TV incorporates an operating system/platform that allows you to access, manage, and view online and network-based media content without the need to connect to an additional box (such as a Roku or Firestick). Smart TVs access online content by connecting to the same broadband router and Ethernet or Wi-Fi network that you use to connect your computer to the internet. Ethernet provides the most stable connection, but if your TV is in a different room or a long distance from your router, Wi-Fi might be more convenient. Once your TV is connected and turned on, you'll be prompted to enter any login information required by your ISP (Internet Service Provider). 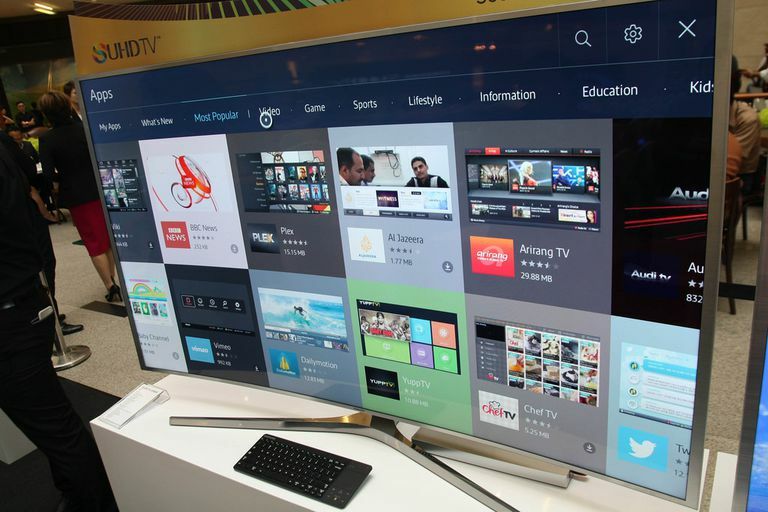 The smart TV will display an on-screen menu that includes a list of available internet channels provided in the form of apps (similar to the apps on a smartphone). Some apps come preloaded, and you can download more to add to the TV's app library. When you click on the icon for a specific channel/app, you are taken to its content offerings, which you can select and view. Exactly how you navigate through the smart TV menu and manage your apps varies with the brand and model. The main benefit of a smart TV is access to a large number of channels that offer TV programs, movies, and music without the need to connect a TV antenna or subscribe to a cable/satellite service. Also, some smart TVs provide web browsing, gaming, and access to compatible media content stored on your computer. Although smart TVs also can receive TV programming via antenna or cable/satellite, Vizio has actually taken the bold step of eliminating built-in tuners and antenna/cable connections on most of its sets in favor of its built-in streaming platform as an all-encompassing replacement. In addition to internet streaming, some smart TVs provide more capabilities, such as Miracast and Screen Sharing, which allow users to view content from compatible smartphones and tablets on a TV screen. Other labels for this feature include SmartShare (LG) and SmartView (Samsung). Some smart TVs are even able to do the reverse: send content from the TV to a compatible smartphone. After sending, the user can continue to view that content on the smartphone, away from the TV. The hype surrounding smart TVs is compelling, but there are some cost considerations and limitations to consider. Although smart TV platforms provide access to a lot of free channels and services, many require either a monthly subscription or pay-per-view fee. When you start adding up those costs, you could end up spending as much, or more, than a monthly cable/satellite bill. On the other hand, you will be paying only for the channels and content you want. The brand/model smart TV determines the services and features you have access to. Although all smart TVs access a lot of the same core services (Netflix, Vudu, Hulu, Pandora), a lot of additional and niche channels might not be accessible on some smart TV platforms. Also, for those who use iTunes to access streaming audio and video content, no TV as of 2018 has this capability — so even if you have a smart TV, you still need to purchase an Apple TV box. Can Smart TVs Spy on You? Using a smart TV may result in privacy issues. Smart TVs and/or the content app providers usually track your viewing habits to provide you with viewing suggestions. For example, every time you log into Netflix, the menu shows what you've watched recently, as well as updated suggestions for related movies or programs that you might like based on your 'watched recently' list. You might think that this type of tracking is a good thing because it cuts search time for movies or programs to watch, but a smart TV might be doing more than just track your viewing habits. If your smart TV has a webcam or voice control, there is a possibility that someone could hack in and see/hear you. Also, any credit card purchases you make using your TV might be trackable by third parties. If your voice control or webcam is on, don't say or do anything that you wouldn't do or say in public — and be cautious with your online credit card purchases. If you recently purchased, or currently have, a TV without smart features or an older smart TV with limited options, you don't need to buy a new smart TV if your TV still works well and satisfies your picture-quality needs. You can add smart features to your current TV viewing experience at minimal cost. A media streamer is typically a small box that plugs into your TV's HDMI port and connects to your internet router via Ethernet/Wi-Fi. If you have an older TV that does not have an HDMI input, your options are more limited, but Roku Express+ media streamer provides analog video audio connections for those cases. Another type of media streamer is a stick that is slightly larger than a USB flash drive and plugs into an available HDMI input. The stick-type media streamer provides Wi-Fi access to your TV, so make sure you have a wireless internet router. The stick also needs to connect to a USB or AC power source. In addition to playing physical media such as Blu-ray discs, DVDs, and CDs, almost all Blu-ray Disc players provide access to a number of internet streaming channels (depending on brand and model). The internet channel selection is usually not as extensive as with a media streaming box or stick, but it is certainly convenient: You don't have to connect both a media streamer and a Blu-ray disc player to your TV, which cuts down on cable clutter. If you are a fan of DVDs, Blu-ray discs, and CDs but want to add streaming as an additional content source, a Blu-ray disc player might be the solution for you. Companies such as Channel Master and TIVO market over-the-air DVRs that combine reception of over-the-air (OTA) TV signals, video recording, and internet streaming in one box. Just as with Blu-ray disc players, the internet channel selection might be limited, and recording features work only with OTA programs. It does provide another option that cord cutters can take advantage of, though. DVRs are more expensive than media streamers and Blu-ray disc players. Although smart TVs and media streamers include some online music channels, music fans appreciate the capabilities of network-enabled stereo or home theater receivers. This option not only provides access to several streaming music services but also plays that music back through the stereo or home theater speaker setup. The result is a much higher-quality listening experience than built-in TV speakers or even a TV combined with a soundbar can deliver. When shopping for a TV, just about all brands/models offer some level of smart functionality that expands your viewing options. Be aware, however, of variations in content access, additional subscription/pay-per-view costs, possible privacy issues, and the need to balance the attractiveness of a specific smart TV with other important factors such as picture quality, sound quality, and physical connectivity. If you are buying a new TV and don't have any other devices that provide access to internet streaming content, then getting a smart TV is a good choice. If you already have a smart TV that doesn't provide access to the number or type of streaming channels you would like, consider adding an external media streamer, streaming stick, or internet-enabled Blu-ray disc player rather than buying a new smart TV. If you already own a TV without smart features but are satisfied with its picture quality and other features, you don't need to buy a smart TV. Just add a media streamer, streaming stick, or internet-enabled Blu-ray disc player to your current setup. If you are concerned about privacy issues, consider an external media streaming device. It won't prevent purchase or viewing habit tracking, but it does prevent direct audio/video spying. If you are interested in audio-only streaming, a network-enabled stereo or home theater receiver will provide better sound quality for music listening than a smart TV. A smart TV is just one way to add internet streaming and related features to your TV viewing experience. Use the guidelines above to decide if it's the best choice for you.